Glutinous rice boiled with chestnuts is a dish eaten in Japan during autumn. It has a very wonderful smell and a delicious taste. Furthermore, it is elegant to eat it with the foods (matsutake etc.) of autumn. 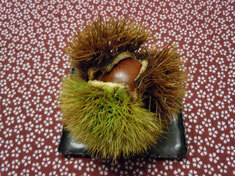 You will understand that autumn has come, when you eat rice boiled with chestnuts in Japan. Nabeyaki-Udon（Udon noodles in clay pots） are the Japanese noodles dishes boiled well with seasonal vegetables, tempura, etc. in the small clay pot. If the lid of the clay pot is opened, the Japanese noodles dish with steam will still have boiled. Therefore, Nabeyaki-udon is often eaten in autumn and winter. In Nabeyaki-udon, since many food with various colors is boiled well, it is very elegant and beautiful. If you travel in Japan during autumn, you will be able to enjoy both wonderful autumnal leaves and delicious Nabeyaki-udon.